Off the shoulder dresses anything has been my obsession this year. I know it's been a big trend for a while, but this year, I just feel in absolute love with them. I feel like it suits my body so well - I feel like it doesn't widen my shoulders or look like I have baby shoulders. I just love how slimming it is as well, I've had a few off the shoulder dresses that have been too baggy and make me look like a pregnant woman - which is unflattering for an unpregnant woman. But I love this dress like crazy. Floral dresses have been on my mind constantly. Before we left to the Dominican, I was on the hunt for floral dresses. I was lucky to have copped a few for our trip, and found a few more since we've come back! I just love how girly they are and I've been just so drawn to pink, purple, blue, based floral dresses. So the color of this dress just a must have for me! 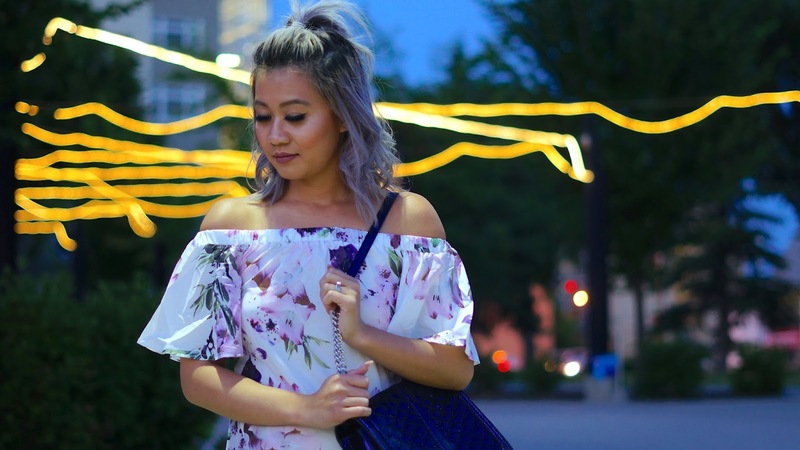 The combination of this dress being both floral and off the shoulder has been nothing but amazing. The color and fit are both so amazing! You can shop this dress in the link above or shop similar looks below! Your Zaful Off The Shoulder Flower Vintage Dress is beautiful, and it looks fabulous being worn by you. I love the floral print, the fluttery sleeves, the gathering at the shoulder-line, and the fabric. I visited Zaful's site and was just looking at their babydoll tops as well - they have some very pretty ones.